The rainfall received in most areas made farmers preparing for the 1st planting season this year. Other areas have however not received any rainfall. Agrodealers observed an increment in granule fertilizer prices when the season began. DAP and NPK products registered, increased the wholesale price for a 50kgs sack to Ugx.120,000 and Ugx.115,000 respectively. Reduced supply of Urea and CAN from major sources led to an increased wholesale prices in Iganga and other markets country wide. A 50 Kgs bag of CAN or Urea costs Ugx.100,000-110,000. The farmers are expecting the rainy season to start in March-April. Some locations are receiving rainfall. Hybrid maize is on sale at Ugx.5,000-6,000/kg in several locations. The food/grain price increased as rural shops have started gathering maize. During February, the grain price increased to Ugx.900/kg but quickly declined to Ugx.780/kg in Kampala. In the rural markets, it increased from Ugx.500/kg to Ugx.600-700/kg depending on demand for the day. Less fertilizer sales were expected in the season due to losses that occurred in the previous year around Busoga region. The Eastern region experienced harsh weather conditions and registered less grain harvest last year. Not a lot of enthusiasm to purchase fertilizer yet, as the season commences. Apparently in Masindi, more fertilizer sales were expected this season due to the increment in price for maize at the beginning of February. Agrodealers continue to be challenged with trading unregistered products. Throughout the month, the weather has been very hot and dry. Apart from farmers who have access to water from streams, swamps and some low-lying areas, there has not been much cultivation of crops. Most farmers in the above areas are basically involved in cultivating vegetables, horticultural products and flowers. Low purchase of fertilizers was registered in different markets at an increasing price. Stocking for the coming planting season has not taken off as the agrodealers are waiting for the rainy season to start. Foliar fertilizer products that can be applied directly were demanded leaving the granules fertilizer products in stock. Demand for fertilizers was registered low as expected. Some agrodealers complained about low fertilizer sales last season and were in the process of receiving replacement stock or otherwise they will incur big losses. Production of bio-organic phosphate, rock phosphate and organic compound fertilizers has started in Tororo district in the Eastern region by a Chinese based firm called Sukulu. 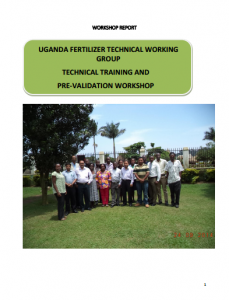 The factory has stated that they will be offering the Ugandan market crop specific fertilizers. Some locations continued receiving rainfall (unexpectedly) in the month of December. This rainfall has facilitated seasonal swamp, enabling farmers to grow extra vegetables and horticulture. A reasonable amount of foliar fertilizers was sold during December for such cultivation. Since the 2nd harvest season for 2018 came very late in December, the fertilizer sales window was off season. Reduction in yields is expected given the disappointment from low maize grain price experienced in the first season and the poor weather conditions that heavily affected most staples traditionally grown in the closing season. Fertilizer prices have stabilized throughout the month of December-January with very low sales because it is off season. However, a few organized farmers who irrigate and produce during the off season are buying fertilizers for their crops and hence maintain the production of these crops even during off season. NPK sales registered better granule fertilizer sales during off season in December. Stockiest were planning to stock their stores in the new year. There are speculations that the maize grain price will be higher than the previous year market price. When the harvest opened in December, the new maize price dropped to Ugx.630/kg in Kampala majorly. The eastern region appears to have serious weather effects and less food harvest during the 2nd harvest period. Karamoja region specifically will most definitely have food security. This has forced the people in the region to meet their basic needs through cattle selling. The slight increase in price especially at wholesale level is attributed to fuel inflation. Low purchasing was registered for upcountry stockiest as they plan for the coming major planting season. 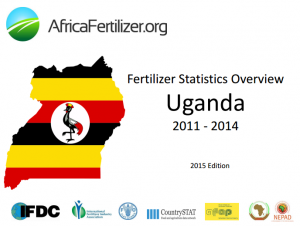 The dry weather in Lira and the northern region at large, rendered stockiest low sales on fertilizer in this month. Some farmers cultivating in the swampy or lower areas bought some fertilizer for their horticultural and vegetable crops. Horticulture and vegetable production thrive in these areas and farmers bought DAP for this increasing its price. Veg Max and NPK foliar products were used for mainly top-dressing vegetables in this region. Super grow was demanded because it’s usually applied during such dry seasons. Harvesting continues for commodities such as maize, beans, millet, sorghum, rice, groundnuts and simsim. The yields were affected by unreliable scattered rainfall. Demand for fertilizer from maize farmers was very low, however, sugar cane growers demanded for granule fertilizers like DAP and Urea but could not acquire enough of it because it was out of stock in Masindi. Stockiests in the area registered very low supply of these fertilizers because the maize farmers lost hope in farming this year. In Mbale, fertilizer was bought for horticultural farming. Commodities such as tomatoes, egg plants and green vegetables were top dressed with Urea and NPK products. Similarly, there was continuous purchase of NPK fertilizer products such as NPK 22 22 and NPK 17 17 17 in Bududa by farmers cultivating horticultural crops like cabbages and onions. The coffee season in the area has just ended and farmers are preparing for the next season next year. DAP sales were very low because of the offseason calendar for major crops in the region. Less rainfall was received in the month of November. Among the foliar products, Veg Max registered better sales because it’s applied as a top dresser on beans, groundnuts, coffee and passion fruit production in most areas. Changing weather effects had an impact of fertilizers sales countrywide. Stockiest noted reduced fertilizer sales especially as a result of reduced maize grain price. Uganda is currently experiencing unreliable rainfall. This situation has distorted the usual distribution of fertilizers this month. More specifically, low maize production this year affected the uptake of fertilizers particularly DAP. During this month fertilizer prices increased due to inflation and irregular supply to the main market, however, in certain areas such as Mubende, fertilizer prices decreased. Main reason being the low purchasing power because of the bumper harvest from the previous season and irregular rainfall received in the region. Among the foliar products, Veg Max registered better sales because it was applied as a top dresser on beans, groundnuts, coffee and passion fruit which had fair commodity prices during the year. In the eastern and part of the central regions, volume of sales for Urea were better than other granule fertilizer sales because it was applied by the sugar cane growers in the areas. Coffee farmers in the Elgon region also used Urea for top dressing. Some input shops in Kabale registered good granules fertilizer sales bought by Irish potatoes and horticultural crop farmers. This month registered low fertilizer sales in the Southern part of the country which hosts the major market in Kampala. Apparently, the rain distribution around the lake basin, western and eastern was very skeptical. Some rainfall was received in August onwards which was presumed as the opening rain season. It disappeared and later some areas received scattered rains. Some crops planted were affected by the scotching sunshine that followed. In some locations in the Central region, crops at flowering stage like maize, have since been stunted due to the extended dry weather. Even if the rain came down abundantly, it appears it would be late because January/ February is usually a very dry period. Low fertilizer and hybrid seed sales were recorded in the period of October due to lack of rainfall in central and western regions. In areas where they received insufficient rainfall during the month of September, they have resorted to spraying Urea after mixing it with water because of the dry weather. 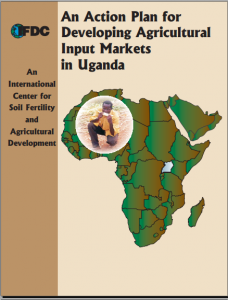 The changing weather pattern has affected fertilizers sales and price in Kampala’s major market. Granule fertilizer price dropped at wholesale to as low as Ugx.85,000 for a 50 kg bag of DAP in some retailers shops. NPK dropped to Ugx.100,000 per 50kgs bag. SSP and TSP were out of stock and rendered too expensive for the importer. In Mubende, one of the central districts known for food production, farmers were very discouraged to engage in production of maize after recording very low market price in the previous season as a result of a bumper harvest. They rejected purchasing of fertilizer since maize is one of the biggest crop they apply granule fertilizers. In the meantime, there was introduction of Grain Pulse, a specialized NPK fertilizer for Coffee, Irish and Maize and this affected the sales of NPK 17 17 17. The take up of the Grain Pulse was good because it was well advertised. Sales for DAP, CAN and Urea were all affected by the introduction of Grain Pulse fertilizers. The farmers needed encouragement from stakeholders such as government and its engagement to subsidize maize price at Ugx.500/kg was welcomed. However, lack of a potential market to absorb this surplus was their worst night mare. The scattered/uneven rainfall received is expected to extend to January 2019. Retailers in the central region are estimated to have sold less foliar fertilizers at an estimated rate of 40%. Due to more demand for DAP that is usually applied at planting season, the wholesale price for a 50 kg bag increased by Ugx.5,000 to Ugx.125,000 in Kampala’s container village, a main or concentration area of input dealers’ location at the end of August. A slight increase in both wholesale and retail price was observed in different regions. Some stockiest noted inflation and effects from the adjusted levy. Given the number of subsistence farmers applying fertilizer especially for maize, the volumes of fertilizer sales might not decline as anticipated. Some input dealers stocked with caution to avoid losses from low turn up for fertilizer purchase because of last year’s low-price bumper harvest. Fertilizer application by subsistence or small holder farmers is on the rise but more so the commercial farmers with bigger acreage have intensified application. The effect of low commodity price from last years’ bumper harvest is most likely to be felt in the northern region where the commercialized farming on larger plots is on the increase. In the areas where rainfall was received much earlier, farmers are weeding their crops. In the southern region /around the lake basin, some rainfall was received but it was not reliable leading to mixed reactions as to whether the rainy season had started. The planting season continues as farmers wait for more consistent rains. In Lira, farmers were beginning to purchase fertilizer especially DAP that they normally use during planting. Fertilizer prices were lower than last month since stockists had not acquired new stock for the season. It appears the new stock of fertilizers will most likely be more priced than the previous month. In locations where they had not yet stocked for the season, the granule fertilizers such as DAP, NPK and Urea were recorded cheaper. Kampala’s main market and a few upcountry markets that stocked for the season noted that fertilizer price had increased slightly especially DAP. Farmers in Kabale, western Uganda, turned up to purchase their fertilizer in time for planting since they had received some little rainfall. This is one of the locations that indicated increasing sales trend especially for DAP. Most of the fertilizers bought here are applied on Irish potatoes, onions and cabbage. In Masindi, farmers are reluctant to purchase some fertilizers given the low current price of maize and other commodities. Stockists purchased seed from seed manufacturers at the same price as last month, however, farmers were not willing to buy seed given the current maize price slump. They have shifted to other crops such as rice, sunflower, groundnuts, beans and soya beans. In Mubende, farmers were very frustrated with the low maize price. They have deserted their gardens and claim banks and other lending institutions are on their necks for not honoring their obligation to pay their loans in time. The government of Uganda has since intervened in the situation and promised to purchase maize grain at Ugx.500/kg. The stockists forecasted low fertilizer sales this season because the biggest fertilizer users are involved in maize production especially DAP. It has started raining but the farmers have not responded by purchasing seed and fertilizer as they usually do to catch the rain. Apparently the maize grain price dropped to Ugx.200-250/kg in Mubende. An estimated 100 bags of DAP are usually sold by a major dealer in this location for this long season, but by the assessment of inflow of farmers, the sale will be low. Some farmers talked to, were however not impressed with the government’s suggestion noting that at Ugx.500/kg they were just breaking even. There is hope that as the maize quality improves, the prices might increase given demand for food at the regional market in Kenya and South Sudan. Apparently, Kenya also registered a good season and are more likely to buy less maize from Uganda. More food will be required for the displaced people in West Nile from Sudan. Likewise, Karamoja region will also require food by the end of the year because their season this year was highly affected by above normal rainfall that phased into floods. A notable increase in the fertilizer prices was registered this month even though the 2nd planting season has not quite kicked off. The increment in price was attributed to inflationary tendencies experienced in the economy. This situation affected most imported products price. In some locations, traders stocked granule fertilizers due to continued rainfall. Some farmers anticipated planting early especially in the eastern and northern parts of the country where rainfall was recorded continuously. Input dealers were busy in Gulu, Lira and Kitgum selling seed and fertilizer for the coming planting season. Stockist are in preparation for the 2nd season planting where they expect to stock more seed and other inputs. Farmers usually purchase more hybrid maize seed because there is limited time between the 1st harvest season and 2nd planting season contrary to the 1st season planting. They may also require preparation of other plots of land since the first season yield is yet to be harvested. In the major supply market of Kampala, solid fertilizer products recorded a slight increment in price. Some traders tied this to the inflationary trend in the foreign exchange rate that gradually increased. DAP sold faster than the other granule products. More foliar products were demanded such as Vega Max, rapid grow, super green and super grow. The first seasonal harvest is approaching. The beans harvest was on going and the market price was at its lowest. The farmers demanding foliar fertilizers continue to top dress the crops as the harvest season gets near. The harvest for most commodities is expected to be good since most areas received normal to above normal rainfall. Some areas are planning for 2nd season planting since the first season is usually short with almost continuous rainfall. In Kabale farmers are purchasing foliar fertilizers for top dressing on crops such as onions and Irish potatoes. There has been a decline in sales of granule fertilizers since last month. This situation apparently has led to a slight increment in the retail price as few buyers are turning up to purchase these products. In Buikwe product prices did not change however, it was observed that fertilizer volumes were purchased more drastically compared to last year’s season A. Several horticultural farmers were procuring foliar fertilizers. The continued rainfall in all regions sustained the supply period longer than usual, however, traders in Kampala’s major input market increased price of the solid fertilizers slightly indicating that they procured some of these products at a different price compare to the initial back in Jan/Feb. There was a slight increment observed in volumes traded this season especially DAP. April started with good fertilizer sales especially in the first two weeks. The situation has since changed towards the end slowing down fertilizer sales especially in Busoga areas where maize farmers decided to plant local composite seed instead of Hybrid seed citing army worm distraction of the later. This has affected fertilizer sales (DAP) which is usually bought in high volumes by the maize farmers. Alternatively, some minimum purchases were done by sugar cane out growers in the region. There was an increase in retail price as few farmers were purchasing fertilizers. Other stockist claim the foreign exchange rate increased in the course of the month thus rendering the wholesale price slightly higher than what it was previous month. This was also the reason for increasing the retail price. 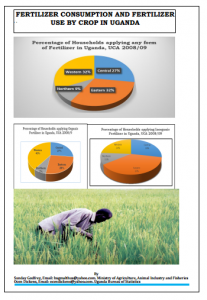 In Arua, there has been an increase in fertilizer use. There has also been more business compared to last year same time because of trade fairs organized in the region between Yumbe and Arua. Stockiest noted that the influx of refugees from Southern Sudan had created a larger market for agricultural inputs such as tools, hybrid seed and fertilizers. Several refugees bought fertilizers for production of maize, beans and vegetables. NGOs and multi-nationals such UNHCR, Mercy Corps, DCA etc. have supported farmers with inputs. The planting season is expected to end by in April. However, stockiest claim if the rains continue, they will sell more top dressing fertilizers especially to the late planters. In Kabale the stockiest noted that current sales were better than last year’s season A sales while in Masindi there have been continued fertilizer sales probably because of the spatial rain distribution. Similarly in Lira solid fertilizers sales were high for crops such as maize, beans, soya beans and simsim. The demand is expected to continue especially for products such as DAP and NPK. During the months of April and May the farmers would then concentrate on purchase of SSP, Urea, some DAP for top dressing. Foliar fertilizers are also high at around this period of the year. In Jinja there was reduction in fertilizer sales from maize farmers who have resorted to planting local and OPV seed because army worm affected hybrid seeds mostly in the previous season. The climate was reported hot and dry in most parts of the country. It is that time when most farmers are preparing for planting. In Jinja more DAP was purchased due to planting in the sugarcane plantation. The increase in price for Super grow has affected use as that farmers cannot afford this especially for top dressing during this dry season and have resorted to other foliar products which stockist normally break bulk into smaller items to allow subsistence farmers buy it. On average stockist located in the outskirts of Kampala’s peri-urban area are projecting to purchase between 10-25Mt of fertilizer regardless the type this season. Government is advising the extension department to advocate for early maturing varieties due to the uncertainty of the (weather condition) rainy season. In Masaka and Rakai- western Uganda, stockist noted that projection for fertilizer purchase will highly be determined by the availability of the rainfall come the new season, but the current low offer price for maize which is one of the staples for which fertilizers are applied will most likely affect the fertilizer sales/price too. The month of December is usually at the middle of the second harvest season therefore it registers low fertilizer sales. With the exception of a few farmers especially in horticulture and vegetable production who maximize profits by producing in the swamps and are mainly interested in foliar fertilizer products such as Vegmax, super grow, super green, rapid grow, green miracle to mention a few plus the numerous boosters on the market. In the rural market, agro-dealers were selling off the balance from the second planting season. It appears they are planning for the 1st season planting and intend to stock in the near future. There was a decrease in the retail solid fertilizer prices indicating less activity during this time of the year. In November, there were very low granular fertilizer sales. It is usually harvest time towards the end of the year November to December and due to shift of the rainfall pattern/ climatic trend, it extends to January/February. Foliar fertilizer products such as Vega max, super grow, super green and others registered some slow sales especially in the horticulture sector. Farmers in the swampy areas were also able to buy some foliar products. At retail level in rural markets there was a slight increase in prices for some fertilizer products although very low demand was reported because these products are highly seasonal. There was a slight increase in fertilizer prices and continued sales compared to the same period in the previous year. This was mainly due to extension of the rainy season in some areas into the final quarter of 2017 which was unusual. There was demand of specific solid fertilizers by specific value chain such as Irish potatoes farmers in Kabale demanding for NPK, coffee farmers in Kapchorwa and Rakai demanded SSP and CAN respectively. Sugar cane farmers in Kamuli demanded for Urea. In the central districts, the rainfall was scattered, fertilizers sales were on a decline because of the end of the planting season. Areas that did not stock up fertilizers during the month retained their initial wholesale purchase price. In Arua, there was some demand for DAP, NPK as farmers continued to plant short maturing crops such as beans especially close to the valleys as the rainfall continues to come down possibly until late November. Vegetable and horticultural farmers in the swampy areas demanded more foliar products. There has been an increase in fertilizer sales countrywide especially granular fertilizers (DAP and NPK’s) due to the rainy season. There were less foliar fertilizer sales compared to the solid ones. The previous good yield in Irish potatoes growing areas of Kapchorwa and Mbale-Elgon region had a positive effect on fertilizer sale this month as more farmers have planted Irish potatoes. In Lira and other parts of the northern region, instructions on fertilizer application demonstrated on seed packets have influenced sales of certain granular fertilizers especially products from Kenya. Traders in Kampala’s Container village an enclave of agro input providers noted that the Kenyan election period earlier affected their business and were only pulling through during September when their consignments got clearance. NPK was much preferred countrywide because farmers found it more productive. It was also noted that it could be applied at different stages of cultivation, and, this time round farmers applied it during planting. Kapchorwa stocked NPK 25:5:5 and 17:17:17 especially for the coffee and maize farmers. NPK was also intensively applied by vegetable farmer’s countrywide. In the highlands of Mbale and Kabale more DAP fertilizers was bought by farmers involved in production Irish potatoes/onions production. That apart, more DAP is usually bought at planting time especially now that the rainy season has begun. Fertilizers products such as SSP, MOP, TSP and NPK 16:16:16 were little known by the market apart from Kampala’s major market and a few supported farmers like in the case of tobacco and sugar cane cultivation where some of these fertilizers were distributed directly to farmers. The utilization of CAN and Urea recorded less application in several locations, however, more DAP and NPK fertilizers products registered a general increased as more awareness gets to the users like the case in point in Arua where SNV maintained an on-farm fertilizer demo.